If you’re sending your luggage via courier, please send them to Address Nozawa. Our staff will show you to Address Nagasaka after check-in. Nozawa Liner bus is located right outside Iiyama station and the signs are well-posted in Japanese and English. Alight at the last stop – Chuo Bus terminal and Address Nozawa (check-in location) is 3 minutes by foot. 1. Walk towards the town, away from the traffic lights. If you are interested in shared taxi or airport bus shuttle, please contact us at least a week in advance. If you’re taking the Shinkansen, we recommend packing your first day’s things in a handcarry and everything else in a suitcase. Then use the “takkyubin” courier service in the airport arrivals area (the biggest company is Yamato with the logo of a black cat on a yellow background) to send your suitcase to the accommodation. Just show the staff the address and they’ll do the rest, and your luggage will arrive 24 hours later. You can on-send to your next hotel, or to the airport for your return. No stress and it is about JPY 2500 per suitcase, depending on the size. The counter staff speak enough English. If you have children up to 12 years’ old, they travel half price, so don’t forget to ask for the child discount! International credit cards are accepted at the ticket office. The ticket machines have an English menu and are easy to use, but only take cash or local credit cards. Most shinkansen have a mixture of Gran Class (first class), Green Class (business class), Reserved Seats and Non-Reserved Seats. There are some trains that only has reserved seating, so take care when you’re planning your trains. The best way to know is to get your tickets via the train station office. Travelling from Tokyo, if you can’t get a reserved seat, don’t worry as you’ll usually get a non-reserved seat on almost any train. If you are travelling in a group and would prefer to sit next to one another, it is best to get tickets with reserved seats. From Narita Airport, take whichever of the Narita Express, or Keisei Skyliner, trains leave first; they’re both reserved-seats-only so buy your ticket before you board. The Narita Express terminates at Tokyo station; the Keisei Skyliner terminates at Ueno. You can take the shinkansen to Iiyama from either of these stations. 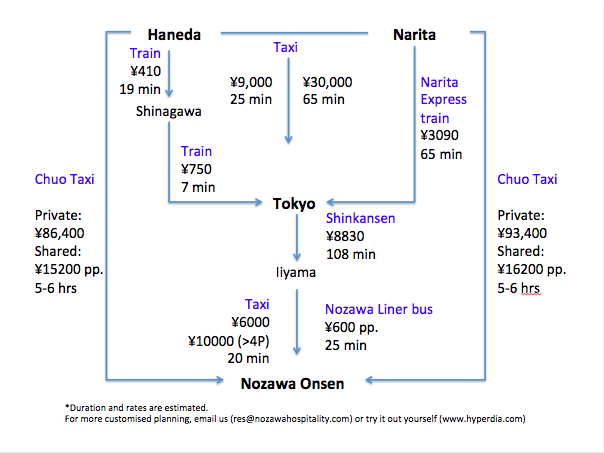 Narita Airport to Tokyo: Take the Narita Express train – 64min. Narita Airport to Ueno: Take the Keisei Skyliner – 45min. The local trains are too slow. Nagano to Iiyama: The Shinkansen takes 11 minutes and costs JPY 2860. The local train takes 47 minutes and costs JPY 530. Check this site for train schedules, rates and even platform numbers! Alternatively if you have a smartphone and a data plan, download the Japan Transit Planner app (by Jorudan, in English) which does the same job. There is a possibility that the platform numbers might change so do check the main board at the station.